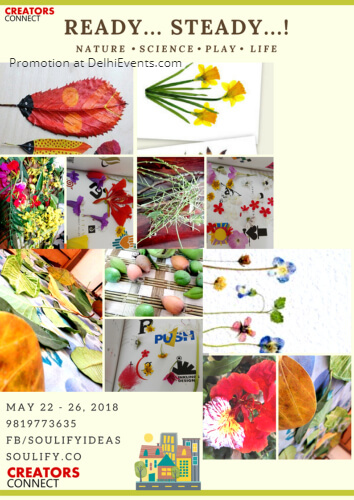 Event Description : KIDS SUMMER CAMP : Creatorsconnect at Soulify.co presents "Nature * Science * Play * Life"
Community Based Experiential Learning Is Real Joy...let's Share Create, Cherish Together!! Experiments, Craft, Field Trip, Traditional Game, Theatre, Storytelling, Animation and Much More. J BLOCK, SAKET, NEW DELHI. Nature Inspiring Storytelling and Planting a Seed or Make a Volcano! Particiapnts Need to Carry Few Tools and Materials Which Is Readly Available at Home and in Surrounding the Material That We Will Provide Will Be Additional Nominal Cost. Please Inform in Advance, However We Accommodate and Welcome the Creators Coming in Last Minute!! Please Note: Creators Connect hosts Weekend Sessions Every Sunday. There is no facilitation cost for the creators connect weekend sessions that is hosted every Sunday, there is registration cost of 200 Rs for first time and 100 Rs. for following Sundays. The registration is utilised for procuring materials, snacks and other overheads.